Sprinter 7007 was the first of the class to be painted in the new V/Line livery, being launched to the public on September 12th, 2007. No further Sprinters were painted in the same way as 7007, where the bands ended midway along the train. Instead the purple band was eliminated, and the red band carried through to the end of the carbody. Sprinter 7002 was first to be released in this variant in November 2007. V/Line commenced repainting their carriage fleet into a new grey, white and red livery in late 2007, the offical launch being on September 12th at Southern Cross Station. So where have they gotten up to since? It took a year for a final version to appear, with carriages being progressively repainted with just a few remaining as of 2010. This is the first in what will hopefully be a series of articles and photoessays on various railway subjects - there are times when an album or sequence of photos are just not enough to tell a story. Metro Trains Melbourne have previous announced that they will be running their own works trains, insead of contacting out to other operators as Connex did. To acheive this, they are leasing locomotive and rolling stock from CFCLA. P&O Trans Australia commenced running their own rail container service between Melbourne and Adelaide in October 2009, running as train numbers MA2/AM2. The locomotives and rollingstock are hired from CFCLA, the wagons being CQWY well wagons and CQMY container flats. In Melbourne the train departs from North Dynon. 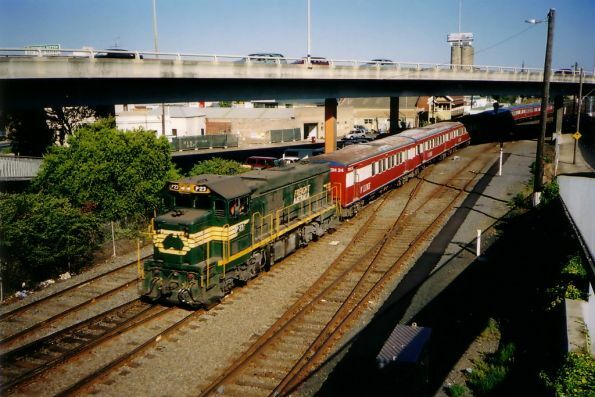 There is also a trip train working between the DP World siding at Swanson Dock West and North Dynon, usually a push-pull via the Bunbury Street tunnel due to the lack of a direct link between the two sidings. Previously POTA had their containers conveyed on QR National's MA6/AM6 service that ran 5 to 6 days per week. As a result QR National has dropped this service back to 3 days per week, with additonal loading being transfered to SCT Altona where it is attached to SCT's MP9/PM8 services.